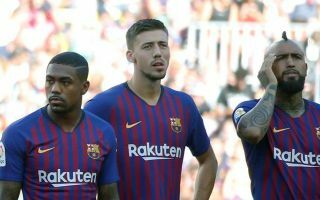 Manchester United are being urged by a number of their fans on Twitter to pounce for the transfer of Barcelona winger Malcom. ESPN are among a number of sources claiming the young Brazilian is available this January, just a few months into his Barca career, having joined from Bordeaux in the summer. In his time in Ligue 1, Malcom looked the real deal with some stand-out displays, attracting links from various big clubs before he eventually ended up at the Nou Camp. However, things have not worked out for the 21-year-old, as he’s made only five La Liga appearances, and only ten in all competitions so far. Still, these Man Utd fans seem to think it would be worth a gamble trying to swoop for him now, which makes sense given their need for more attacking players. Alexis Sanchez has flopped since joining the Red Devils last January, and Malcom could be an ideal like-for-like replacement. Anybody thinking about United signing Malcom on loan? If Malcom is available get him, won't cost a massive amount as he's not wanted. He's not my first choice for RA but there's no denying he's got enough quality to be a United player.